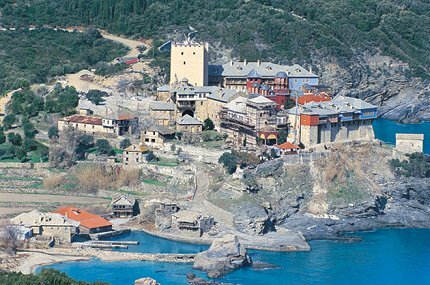 The “Royal and Patriarchal Monastery of our Lord and Saviour Jesus Christ the Pantokrator” stands at the foot of a wooded slope on an imposing rocky headland rising approximately 30 metres above the sea on the north side of the Athos peninsula. This location gives the monastery the privilege of magnificent views, both of the North Aegean Sea with the island of Thassos, the more distant ones of Lemnos and Samothraki, and even distant Imbros when visibility is good, as well as along the coast of the Holy Mountain towards the magnificent Athos with its steep summit. 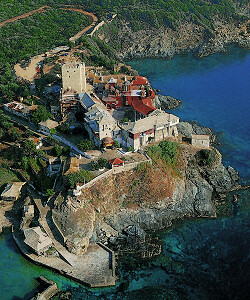 Aerial view of the monastery. The monastery occupies an imposing site, dominating the surrounding area. On its south side, the cliffs fall away to one of the two mantrakia (inlets) of Mount Athos, where small boats used to seek refuge from rough seas in the past, and which has been shaped into a small harbour. In addition to the approach from the sea, a road has been opened up to the monastery from Karyes. It winds through the forest, branching off from the road to Iveron shortly after the bridge. The monastery is also connected by paths with the monasteries of Vatopedi to the north-east and Stavronikita and Iveron to the south-west, while a good paved road leads to the dependent skete of Prophet Elijah through beautiful scenery. In older Byzantine documents, the monastery is referred to as “a divine study of Christ Pantokrator the Saviour”, and in later documents as “the Royal and Patriarchal Monastery of our Lord God and Saviour Jesus Christ the Pantokrator”, which reminds us of the older Byzantine monastery of the same name, the famous monastery of Pantokrator in Constantinople, in which a number of great figures from the history of monasticism settled during the Byzantine era. The monastery holds seventh place in the Athonite hierarchy of twenty sovereign monasteries, after the monastery of Koutloumousiou and before the monastery of Xeropotamou. 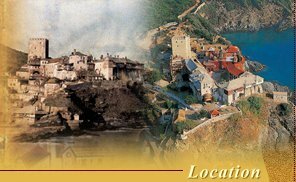 It maintains quarters for its representative in Karyes, with a chapel dedicated to the Three Hierarchs. Every five years its representative participates in the four-member Holy Epistasia. It belongs to the group of four monasteries in which the senior monastery, having the Protepistasia, is Iveron, and the others are Philotheou and Simonopetra. South-west view of the monastery’s buildings, the harbour, the shipyards and the workers’ houses.